I'm always looking for ways to make meals healthier, and sausages are one of the things that I like but that really need an update. I usually cut one up into smaller pieces so that it flavours the entire dish without adding a ton of calories or unhealthy fat. 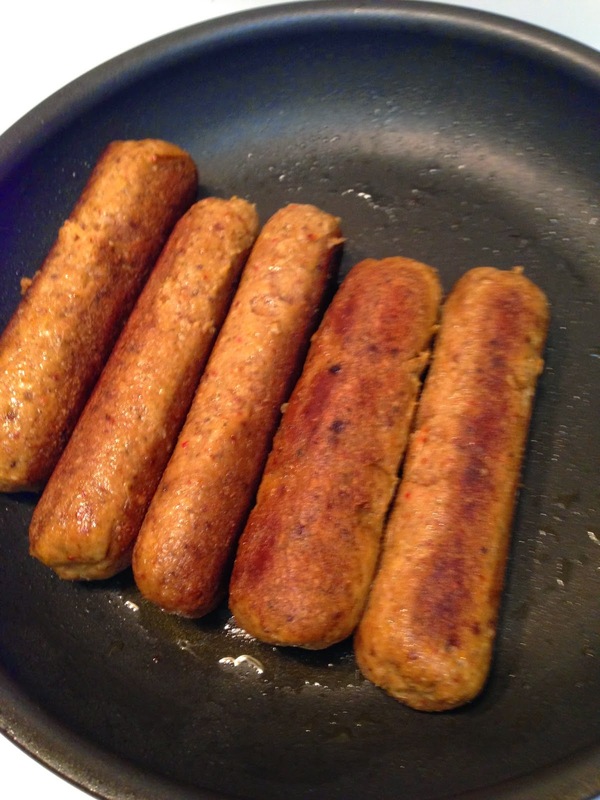 However, this vegan gluten-free sausage is a great way to get the flavour in a much healthier way. It is based on a recipe by David Frenkiel and Luise Vindahl and is a bit like a falafel. 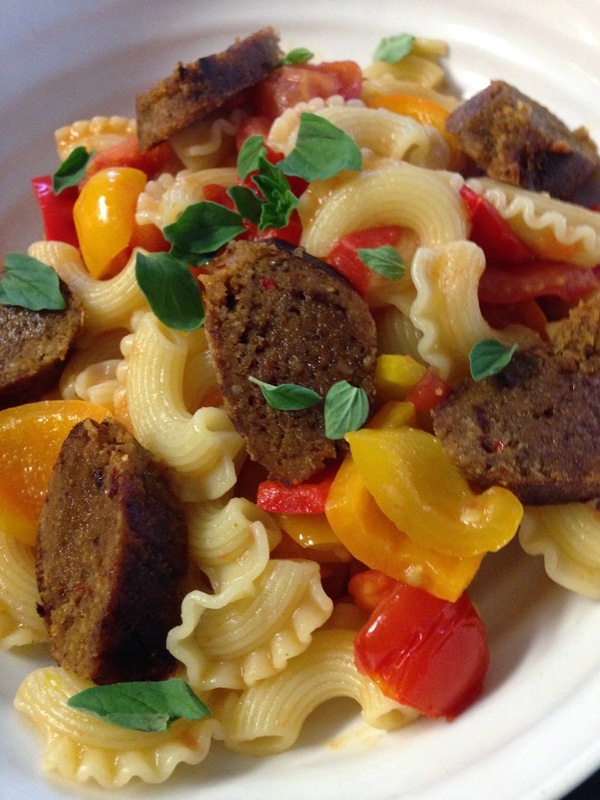 If you don't want a vegan sausage or don't have the time to make them, you can still make the pasta dish with a bit of regular Italian sausage. After going to three stores to find basil, I struck out and opted for fresh oregano, but I would definitely use basil, if possible. You will need cheese cloth and kitchen string to make the sausages. Makes 5 sausages. Pasta serves two as a main course (uses two of the sausages). 1. In a food processor, pulse together the first 11 ingredients. 2. Add the next three ingredients and pulse until completely combined. 3. Add the olive oil and the water and pulse until mixture forms a dough ball. 4. Separate into five equal portions and roll into sausage shapes. 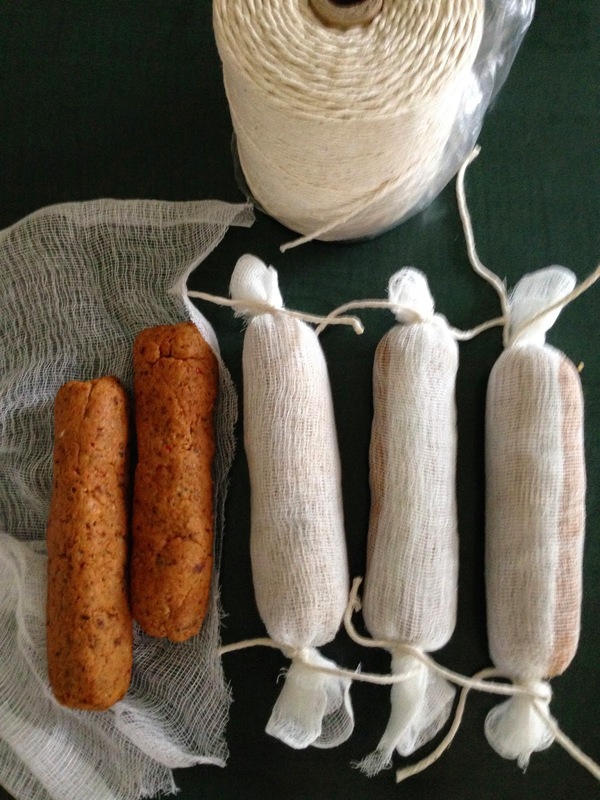 Wrap in cheese cloth and tie each end with kitchen string. 5. Bring the vegetable stock to a simmer in a large frying pan and simmer the sausages for 45 minutes, turning half-way through. 6. Remove the cheese cloth by cutting off the ends. Then, fry the sausages in olive oil until they are brown on all sides, about 10 minutes. 7. If you are making the pasta, do so while the sausages are frying. If you have leftovers, cool and freeze them. 1. Boil a large pot of salted water for the pasta. Start the rest of the recipe while the water comes to a boil. When the water is boiling, add the pasta and cook according to package directions. 2. 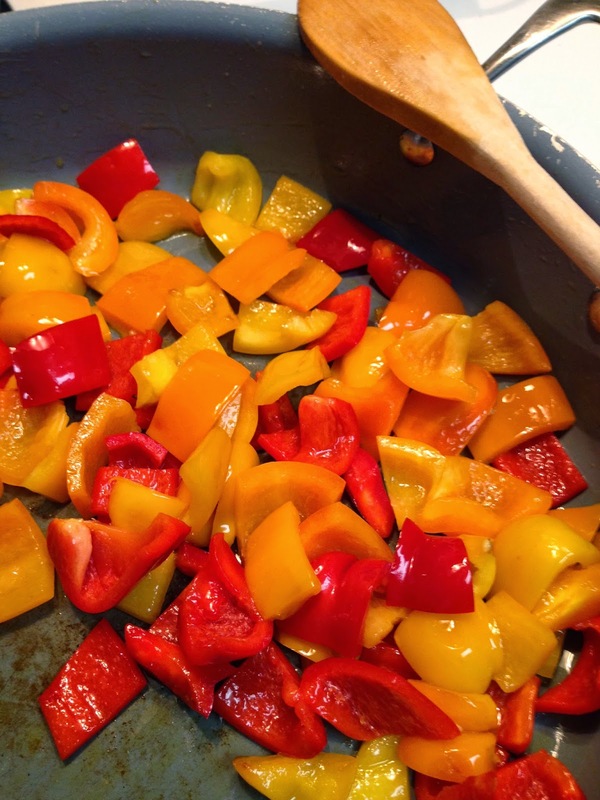 In a large frying pan, heat the oil and red pepper flakes. 3. Add the onion, peppers and a bit of salt to the oil and sauté until the peppers are just tender. 4. When there is about 3 minutes left in the cooking time of the pasta, add the garlic and tomatoes. 5. Add the cooked pasta to the peppers and toss to coat. Add black pepper as desired. Add slices sausage. Serve topped with basil and parmesan (optional). Enjoy! ** If you would like a saucier pasta, you can use a 28 oz can of diced tomatoes instead of the fresh tomatoes. 1. Rice flour and xanthan gum (pronounced zanthan) can be purchased at an organic or health food store. 2. So can unsulphured dried apricots. If you can't find them, though, just use regular ones. 3. 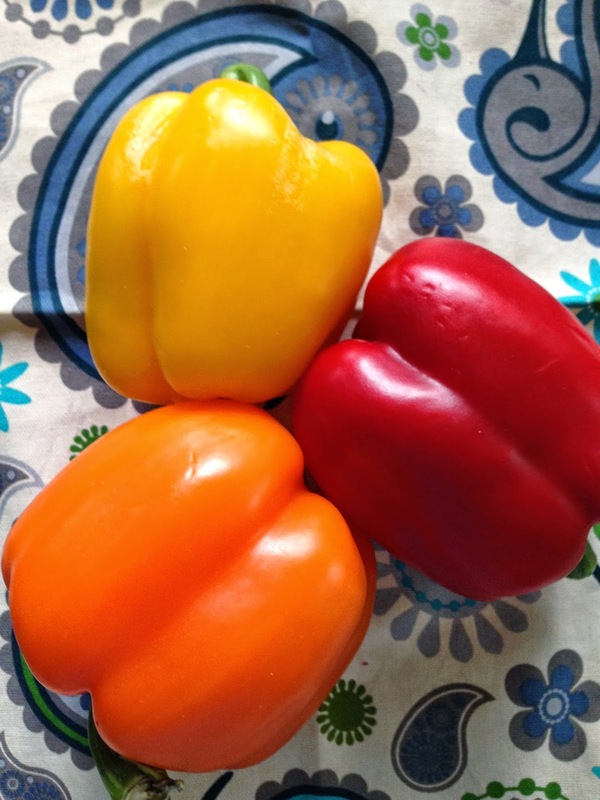 When they are in season, you can find many different colours of peppers at the Farmers Market or Italian Store. Try different combinations.